Barack Obama increased government spending by 84% . 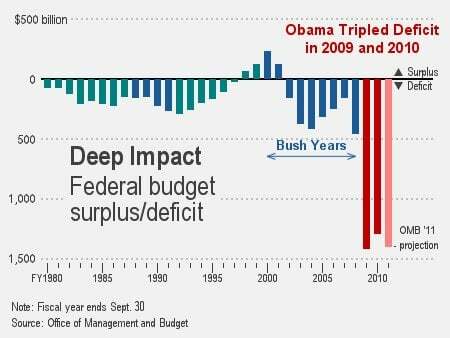 He tripled the national deficit in one year. Last year the deficit was $1.29 Trillion dollars. But, he’s not finished yet. Today the White House announced that Obama would freeze spending at current levels. In response, Republicans today voted to reduce spending through a transition to non-security spending at fiscal year 2008 levels. The roll call was 256-165. 165 democrats voted against the spending cuts. Congressional Republicans on Tuesday sought to put President Barack Obama on the defensive ahead of his State of the Union speech as they pressed their plans to slash domestic spending. The Republican-controlled House of Representatives approved a symbolic measure that touts their intention to slash domestic spending by at least 18 percent in the coming weeks. The actual vote to cut spending will come during the same week that Obama is expected to unveil his budget proposal for the coming year, House Republican leader Eric Cantor said. The scheduling decision by the No. 2 Republican in the House sets up a head-on clash over spending the week of Feb. 14, a time when Congress is usually focused on the president’s spending proposals for the coming fiscal year. Republicans have announced plans to roll back domestic spending to 2008 levels to narrow trillion-dollar-plus budget deficits when current funding expires in March.